Home USA Six Flags Buys 3 Waterparks and 2 Theme Parks. Six Flags Buys 3 Waterparks and 2 Theme Parks. Six Flags Purchases 5 New Parks. The purchase of the 5 new parks means the total number of Six Flags parks is now at 25 in North America. The parks joining the Six Flags family are Wet n’ Wild Splashtown, Houston’s largest waterpark. Wet n’ Wild Phoenix, the largest waterpark in Arizona. Darien Lake near Buffalo, NY, which Six Flags used to own. 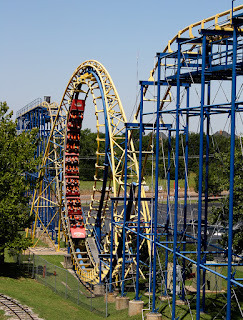 Frontier City, an iconic part of the Oklahoma City landscape. And White Water Bay, near Frontier City. “'We are thrilled to welcome these outstanding properties and employees into our family of parks and look forward to sharing the thrill of Six Flags with guests of all ages in these key markets,' added Reid-Anderson. Darien Lake has 8 Roller Coasters, including "Tantrum," a 'Euro-Fighter' model coaster, opening this year. Frontier City boasts 5 roller coasters, including an Arrow Dynamic's Shuttle Loop coaster!